Black Hammer #2 Review – AiPT! Last month Black Hammer hit shelves and provided a solid, intriguing introduction to Lemire’s latest series. Can the second issue follow up on the introduction’s success? Is it good? While the first issue gave us an overview of the team as a whole, this month we get a closer look at Gail’s (aka Golden Gail) backstory. Not only do we learn how Gail obtained her powers and what exactly she’s capable of, but we come to understand why she’s so miserable here in this new world. As far as Gail’s origin story, Lemire uses the character as a nod to DC’s Shazam, but includes a small twist to add a new perspective. Gail was gifted the powers by a wizard and when she shouts his name, “Zafram”, she turns into (and here’s that twist) the youthful and gifted nine-year old heroine, Golden Gail. With her magic word no longer effective, Gail is stuck in the body of the adolescent and forced to play her part as the daughter of Madame Dragonfly and granddaughter of Abraham Slam. The issue simultaneously chronicles the first day of school for Gail and her personal struggle to continue the mundane and, in her case, juvenile lifestyle. While the issue centers on Gail, we also get a better look at Madame Butterfly and Walky’s attempts at communicating with the outside world. An obvious question within the first issue is why the heroic team decided to settle in the desolate agrarian town in the first place and the answer is quite simple: they can’t leave. Given only the vague explanation “…we all know what happened the last time one of us tried” in regards to why the heroes haven’t relocated, this issue has taken the series a step further into the science fiction genre. What piqued readers’ curiosities in the first issue was the fact that Lemire was putting a unique spin on classic superhero homages. Unfortunately, in this issue we don’t get as much “new” material or concepts with the storyline relying on key tropes and archetypes. While the establishment of Gail’s backstory is essential to the series in the long-run, its generic nature doesn’t do much for readers in the present. It’s obvious that Gail’s character is supposed to parallel a Shazam figure, just as Abraham resembles Batman and Barbalien is seemingly similar to Martian Manhunter, but Lemire may begin to lose readers’ interest if there isn’t an appropriate blend of new material amongst the literary homages. That’s not to say this isn’t a good issue. The end of the issue doesn’t have the same dramatic effect as the last one, but it still maintains the air of mystery Lemire has done a great job of creating whether it concerns the heroes’ disappearance or even the nature of the characters themselves. It’ll be interesting to see if Lemire continues to include individual origin stories with the following issues, but I’m hoping to see more about the title character himself considering he wasn’t even mentioned in this latest issue. 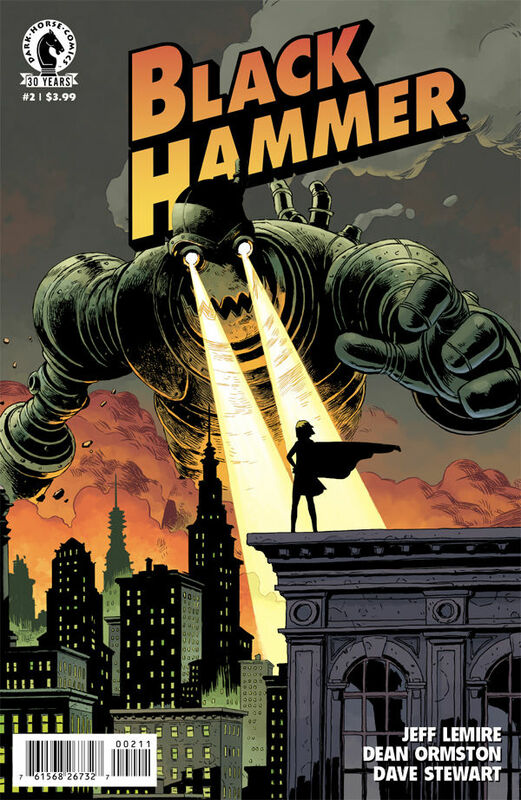 Black Hammer debuted as a healthy balance of old and new concepts and while it can be considered an homage to the Golden Age of comics, this particular issue loses some of its magic with the lack of original material. However, we gain more insight into Gail’s backstory and information surrounding why the team is forced into the such a lifestyle. This is still a series to keep on your pull list.